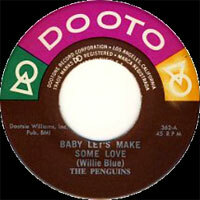 Groupe Doo Wop US originaire de Los Angeles (Californie). Les "Penguins" ont enregistré au milieu des années cinquante pour Dootone Records. Puis ils passeront chez Mercury, Atlantic, Dooto, Eldo, Sun State et Original Sound Records. 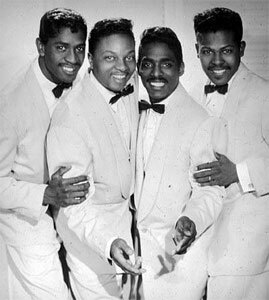 Le groupe était composé de Curtis Williams, Cleveland Duncan, Dexter Tisby et Bruce Tate. 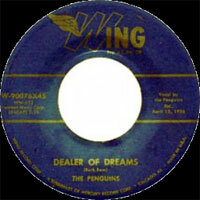 Best known for their hit single "Earth Angel," the doo wop quartet the Penguins were never able to replicate the success of their only Top 40 hit, but the song nevertheless became a rock & roll classic. 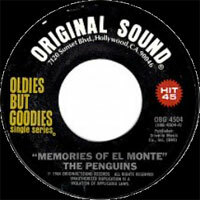 The Penguins formed in 1954, when the group's members -- Cleveland Duncan, Curtis Williams, Dexter Tisby, and Bruce Tate -- were all attending Fremont High School in Los Angeles, CA. Although he wasn't the lead singer, Williams was the leader of the group. 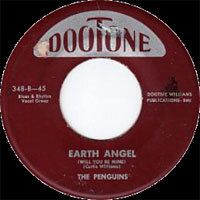 He learned "Earth Angel" from Vocalsist Jesse Belvin -- some sources claim that Williams wrote the song alone, others say he co-wrote the song with Belvin, while others claim Gaynell Hodge, a member of the doo wop group the Turks, wrote the song with the duo (in fact, Hodge won a lawsuit filed in 1956 that gave him a co-writing credit) -- and had the Penguins sing the song. 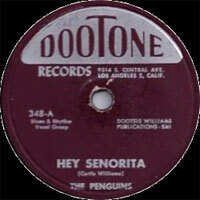 Around 1954, the Penguins signed with the local Los Angeles independent label Dootone Records. 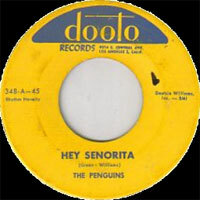 The group's first single was going to be the uptempo "Hey Sinorita," and the ballad "Earth Angel" was going to be the B-side. 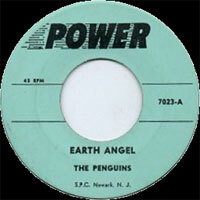 Upon the release of the single in the latter half of 1954, Los Angeles radio stations were receiving more requests for "Earth Angel" than "Hey Sinorita," and the song soon became the record's A-side. By the beginning of 1955, the single had scaled the national charts, spending three weeks at the top of the R&B charts and peaking at number eight on the pop charts. 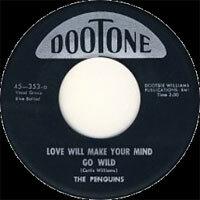 For the next few years, the Penguins continued to record singles for Dootone Records. Shortly after the success of "Earth Angel," Tate left the group and Randolph Jones became their baritone Vocalsist. 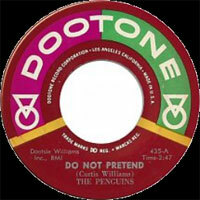 Around 1956, the Penguins left Dootone Records and signed with Mercury Records. 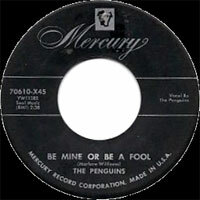 After cutting some sides for Mercury, the group moved to Atlantic Records, where they had their second and final hit, "Pledge of Love," which climbed to number 15 on the R&B charts in the summer of 1957. 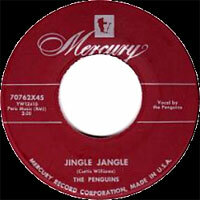 That same year, the group released its only album, The Cool, Cool Penguins. 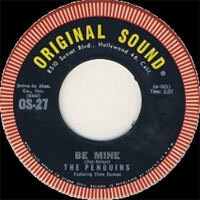 By 1959, the Penguins had returned to their hometown of Los Angeles; shortly after their relocation, they broke up. 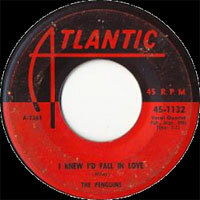 Over the next four decades, Cleveland Duncan led various incarnations of the Penguins through reunion tours and re-recordings of their hits. 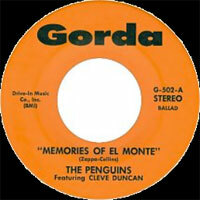 In 1963, Duncan, Tisby, and two new members recorded "Memories of El Monte," a song future Mothers of Invention members Frank Zappa and Ray Collins wrote specifically for the group; the single failed to make any impact. Duncan went back to leading new incarnations of the Penguins, while Tisby briefly joined the Coasters. 1984 SP Original Sound Oldies But Goodies OBG 4518 (US) .